The Paris Terrorist Attacks and Other Catastrophic Events: How Can We Help the Children? A week after the terrorist attacks in Paris, we awoke to the news that all of Belgium was on high alert and Brussels was in lockdown, with subways, malls, public markets, and schools all closed and residents advised to stay home. Although a recent poll revealed that 83 percent of Americans believe a terrorist attack on U.S. soil is likely in the near future, most of us living on this side of the Atlantic continued our usual activities, worrying more about Thanksgiving dinner and Christmas shopping than about terrorists. But what about our children? But what were our children thinking and feeling? In families with a direct tie to Paris or Brussels, even the youngest children knew something was terribly wrong. They could feel it in the air. It was in the tension in people’s faces and voices, in the way their parents were glued to the news, their attention scattered, their tempers short, their usual rules relaxed or more strictly enforced. It’s hard to keep a secret in this global village of ours, where news is constantly available and social media connect us all. And children who have links to Europe may not be the only ones affected. If you’re listening to the news or even discussing the possibilities of a terrorist attack on U.S. soil while your children are present, your child may react. Terrorist attacks, riots, shootings, hurricanes, earthquakes, and other disasters create a sense of helplessness in everyone, and children are particularly vulnerable because they depend on the adults around them to make them feel safe. Their ability to recover is intimately connected to their family’s sense of well-being and the ability of their families and teachers to comfort and reassure them. How do we know when children are upset? Some children react right away; others need weeks to show their fear, anger, and sadness. Some bounce back relatively quickly; others take a long time. Boys tend to recover more slowly and act more aggressively; girls express their feelings in words and ask more questions. Children whose behavior was already out of control. Children five years and under may cry, whine, throw tantrums, or fear strangers. They may want to stay home, cling to their parents and favorite objects, and dread new situations. They may eat or sleep badly and regress into behaviors they used when they were younger, like thumbsucking or having toilet accidents. School-age children may also become aggressive, disruptive, angry, and irritable and have trouble paying attention. Or they may withdraw and feel depressed or anxious. Children who are surrounded by angry people looking for revenge may respond angrily to their peers. 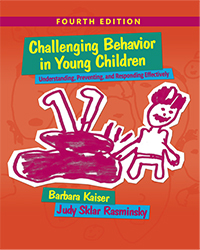 In all of these cases, challenging behavior is often the result. How can we help the children? What can we do to help our children feel safe? And what can teachers do to help children and parents when any catastrophic event takes place? You can certainly provide parents with information. They may not be aware of what’s developmentally appropriate for their child to know or how much he can understand. Although watching the news and talking to others may alleviate their own anxiety, they probably don’t realize the impact it has on their child. Gently help parents to understand the need to limit what they watch and talk about when their child is present. Families also need to know how to recognize their child’s anxiety and what they can do to assuage it. Children need a chance to ask questions and express their thoughts and feelings. But they will take their cue from the adults they trust. If we don’t speak, they will conclude that the events were too dangerous to touch. They may hide their feelings or think something is wrong with them for feeling as they do. They won’t have the courage to ask us questions or tell us how they feel. Parents (and teachers) need to listen calmly and without judging and validate the child’s feelings. Make it clear that it’s normal to feel upset or angry. Children don’t have to think their parent or teacher has all the answers, but they need to feel they’re understood, that their concerns are valued, and that the grownups in their lives will keep them safe. Caring adults should emphasize children’s strengths and remind them of how they’ve coped with problems in the past. It’s also reassuring when adults show that they’re all right even if they feel sad or worried or angry. Children who see that their parents and teachers can handle the situation are more likely to handle it, too. Here is an example of how one parent helped his six-year-old son deal with what happened in Paris. Play is one of the best ways for children to express what they feel and move toward recovery. It is normal and therapeutic for them to recreate the same scenes over and over—it helps them to gain control of the situation. They want to be big and strong; they want to be heroes who save the world; and sometimes they even want to be villains. Play is how they acquire this power. Look and listen carefully so that you can support their efforts. Talk with them about what they’re doing and create opportunities for them to identify with the people who helped—firefighters, police, doctors, nurses, ambulance drivers and technicians. Drawing and writing are also extremely effective ways for children to deal with their feelings. And you can help them to release tension by planning lots of physical activity and tactile play with sand, water, or play dough. When life feels insecure and unpredictable, children need routine. Consistency brings comfort and the sense that everyday things haven’t changed. Both teachers and parents can calm everyone’s nerves by slowing things down, playing quiet music, and speaking in a calm voice, but as soon as possible they should return to normal activities. Some children will find it hard to make choices, but others will need choices to feel more in control. Some will need lots of hugs, hand holding, and chances to sit on your lap; others will find it hard to meet demands. Be sensitive to what each child needs and adjust activities accordingly. When there is so much anger and pain, children need positive ways to express their feelings. Parents and teachers can remind them that there are many adults working to protect them and they can help by making cookies, writing letters, or drawing pictures for the rescue workers, the police—or the President or the Mayor. These activities direct negative energy constructively and offer a sense that one person can make a difference. When you work together, children, families, and teachers all benefit, and a deep sense of community is likely to emerge. Are the children around you showing signs that they’re upset by the Paris terrorist attacks and the lockdown in Brussels? How are you handling this situation? Have you talked with them, and what did you say? Have you talked with their parents? We’d like to hear about your experience. Chandra Ghosh Ippen, Alicia F. Lieberman, & Patricia Van Horn. After a crisis: Helping young children heal. National Child Traumatic Stress Network. Diane E. Levin. When the world is a dangerous place. Educational Leadership. Paul Myers. Tips to help children cope with disasters. Teaching Young Children. National Child Traumatic Stress Network. Parent tips for helping preschool-age children after disasters. NAEYC. Coping with violence. A list of resources. Tragic events. The Fred Rogers Company.